Air Force One is a term we all know well. It’s a cultural phenomenon, a symbol of leadership, success, and power in more ways than one. Of course, the original use of the term — that of the proper call sign for the presidential aircraft — is the most important of these symbols. The callsign "Air Force One" has long represented the Air Force airplane on which the president of the United States flies. The term, though, has manifested in other, more casual and creative ways amongst our American culture. Nike, for example, designed a shoe called “Air Force 1” that happens to be the best-selling athletic shoe of all time. And then there was that 1997 blockbuster movie of the same name starring Harrison Ford (a pilot himself), as the President of the United States who escapes from his presidential airplane in a high-tech escape pod. The film was nominated for two Oscars. And even though the term is supposed to be used as the call sign for any aircraft the President of the United States flies on (if he were flying in a Cessna 172, for example, it would use the "Air Force One" call sign to communicate with ATC), it's become a term used to reflect the specific Boeing 747-200B aircraft that is designated for presidential use. And today’s Air Force One might not have an escape pod, but it has just about everything else. And as names go, "Air Force One" has gone from being a term that represents not only the call sign of any Air Force aircraft on which the president is flying to describing the most recent model of the presidential aircraft — the Boeing 747-200 itself. It displays the presidential seal and the words "United States of America" as the main part of its paint scheme, giving it a fame and notoriety of its own and making it recognizable everywhere it goes. Air Force One, as most of us know it, is the most recognizable and notorious Boeing 747 in the world. The presidential airplane was not always a Boeing 747. In fact, the first flight made with a president on board was when Franklin D. Roosevelt flew on the Clipper, a Boeing Model 314 Flying Boat, which took him to the Casablanca meeting in 1943. Shortly after, General Hap Arnold insisted that the president fly on an Air Force aircraft instead of a Navy plane, and soon a presidential aircraft was designed specifically for presidential travel. The first version was supposed to be a C-87, the military version of the B-24 bomber, but the aircraft was not up to the standards for the president, whose secret service denied it. This spearheaded the building of a new aircraft — the VC-54 Skymaster. The Skymaster was a modified military version of the civilian DC-4 aircraft already in production, but it became the first purpose-built presidential aircraft, and the first one was built specifically for Franklin D. Roosevelt in 1945, complete with a conference room and a bulletproof window. Since then, many different airplanes have been used by presidents. The DC-6, different versions of the Boeing 707, and the currently used Boeing 747-200 have all been used as president’s airplanes. Boeing’s new 747-8 is currently scheduled to be the next aircraft delivered to the President of the United States, probably to be flown by the president beginning in 2024. President-elect Donald Trump made headlines shortly after the 2016 election by calling out Boeing for the high costs of the new 747-8 and demanded that the deal be canceled. Shortly after, Boeing announced that they were committed to keeping the costs down and would not exceed $4 million budget as Trump predicted. In the meantime, Trump and perhaps even his successor must settle for the 747-200 (or Trump's own 757), which aside from the old age of the aircraft and the associated maintenance problems, is hardly settling. 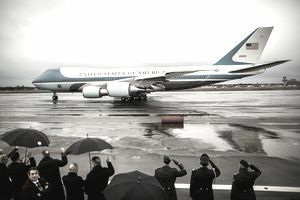 The president’s two custom-designed 747-200s are operated by the 89th Airlift Wing at Joint Base Andrews in Maryland, where a combat-ready group of more than 1,000 people is prepared and ready to handle the responsibility for presidential transport as well as other VIP transport operations. When the president travels, he is typically accompanied by a variety of other aircraft, including C-17s or C-130s, which are flown ahead of the president to carry security detail, supplies, equipment, and all of the required people to assist. The current Air Force One fleet includes two Boeing 747-200 airplanes which originally rolled off the line in 1990 completely customized for the President of the United States, who at the time was George H. W. Bush. The 747 production itself was an enormous feat in the 1960s, the first 747 aircraft was built in just 16 months and was the largest civilian aircraft in the world at the time. It was built as a replacement for its predecessor, the Boeing 707, which was at the end of its lifetime. With over 1,500 aircraft sold, the 747 is the most successful wide-body aircraft to date. The 747-200B offers more than 4,000 square feet of onboard space and includes a conference room, dining room, living quarters for the president, office space for the cabinet members, and space for 100 passengers and crew members. Inside Air Force One is also a medical suite that can be transformed into a surgical suite. And, as you might image, a doctor is on board and ready to serve at all times. The 747-200B aircraft is powered by four General Electric CF6-80C2B1 jet engines — a family of engines chosen to power the DC-10, Airbus 310, the Boeing 767, and the Air Force’s C5 Galaxy, and is rated for ETOPS 180. The CF6 engines on the 747-200B are rated to provide 56,700 pounds of thrust each. The president’s 747 is also equipped with both front and back airstairs, as well as a self-contained baggage loader. Another drastic difference between this 747 and others is that Air Force One has the ability to be refueled in flight, giving it unlimited range and endurance, and ensuring that our president can stay airborne as long as necessary. One of the most important differences between the Air Force One customized 747 variants and the “typical” 747s from the line is the avionics systems and onboard electronics, which provide a high level of security for the president. The onboard electronics systems are hardened to prevent interference from an electromagnetic pulse from a nuclear blast. And the aircraft is equipped with the most advanced, state-of-the-art equipment, providing a mobile command center for the president in a time of need. According to one source, there are 85 telephones and 19 televisions on board Air Force One, along with a variety of fax machines, computers, two-way radios and probably satellite phones. Most of what’s on Air Force One is classified, but you can bet that the aircraft is equipped with weapons systems, radar-jamming, a variety of next-generation onboard equipment, along with various types of preventative measures to manage in times of crisis, ensuring the president is prepared for any emergency imaginable. After citing increasing maintenance costs and increasing aircraft downtime, the Air Force is seeking a new Air Force One, and they've once again selected Boeing as the company that will provide the successor to the current 747-200B aircraft. The current pair of 747 aircraft are nearing their life expectancies, and according to one air force staff member, it's getting more and more difficult to keep up with the maintenance of the aging 747-200B. A new aircraft has already been ordered: The 747-8. The newest version of the landmark aircraft will provide the president with an even more capable and efficient aircraft and will mark a half-century of Boeing providing aircraft to the Commander-in-Chief of the United States of America. The 747-8 will emit 16 tons less of carbon dioxide emissions per trip than the 747-200 airplane and will fly 1,000 miles farther. It will go slightly faster than the -200 model, but at 0.855 Mach (compared to 0.84 Mach), the new version will be the fastest commercial aircraft in the world. The -8 will have a wingspan of almost 30-feet longer than its predecessor, and it will be 18 feet longer in general, resulting in a heavier takeoff weight, at 987,000 pounds instead of 833,000 pounds. The exact costs of the program have yet to be determined, but advocates of Boeing say that canceling the order would be a huge mistake. Trump reportedly met with Boeing in December to discuss reducing costs associated with the program.